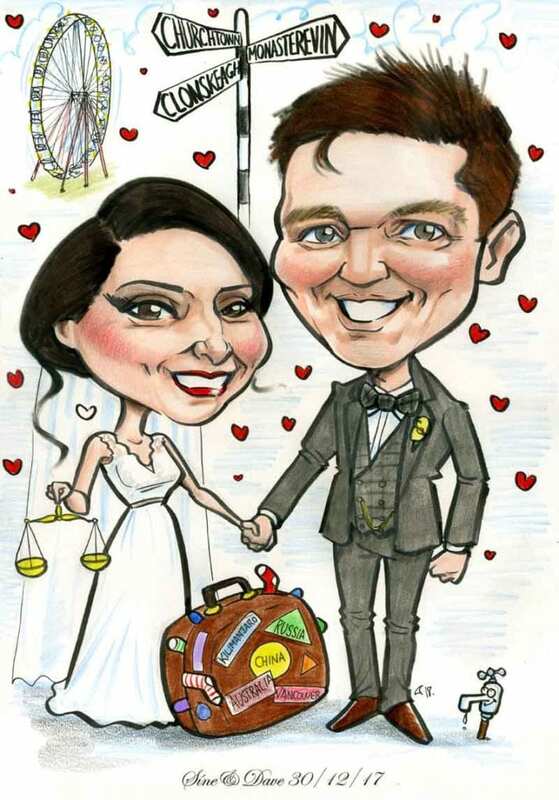 Allan did a superb caricature of my sister and husband on their wedding day. Every detail was perfect and they were really thrilled to receive it. Highly recommend Allah’s caricatures, a great wedding present! If you’re interested in ordering a caricature online click here. You can read more of my reviews on Google here. My caricatures start at €50 and are available for delivery all over Ireland. I have a selection present caricature sizes and you can order framed or unframed. Framed work is carefully packaged and shipped by courier for next day delivery. Simply drop me a line and I’ll advise you of the process for ordering a caricature online in Ireland. I can include many different types of reference in your caricature, from pets such as dogs and cats, to hobbies from fishing to golf, to work references from accountancy to being a naval officer, to things only you and the subject of the caricature will understand! In over 20 years of drawing caricatures I’ve seen it all! I don’t ask any questions I just do the drawing so feel free to ask!